Add architectural elements to your home by exploring the different types of fireplace mantels that can be used as your room’s focal point and top it with personalized accessories for added interest. The fireplace mantel is a decorative frame that surrounds the fireplace and its protective frame on both sides. They often serve as the room’s focal points and has become an integrated part of interior architecture and design. These decorative frames first appeared in the American homes in the Colonial periods. The first American fireplace mantel was a simple wooden trim with a coarse brick opening. Wood paneling that extended over the entire fireplace wall was the trend in the 18th century. During the Georgian period, fireplace mantels were luxurious showpieces often accompanied with large columns or pilasters and meticulously carved high mantel shelves. It was also fashionable to have fireplace overmantels with a second set of columns or pilasters. Federal style fireplace mantels, on the other hand, were simple yet refined and didn’t include overmantels. They were embellished with garlands, urns, and delicate moldings of classic motifs. The Victorian period broke away with the restraint and simplicity of the Federal period. Victorian style fireplace mantels were embellished with imaginative motifs and included overmantels with display shelves and inset mirrors. They also still included pilasters, columns, entablatures, and classical moldings but were liberally mixed with Gothic shapes, spindle work, and exotic Asian imagery. Perfect in a very large room with plenty of space, not only for the mantel surround but also for the eye to wander freely, mantel surrounds are much more commanding and will make your fireplace become the center of attention. Because they completely frame the fireplace rather than simply topping it the way that mantel shelves do, you are likely to appreciate how impressive your mantel surround will be. As long as you have ample room on either side of the fireplace for this type of mantel, and as long as your room is large enough to house this larger piece, it can be a great addition to your home. Mantel surrounds will draw the gaze up the height of the fireplace, making it a much more commanding focal point in the room. This is especially true if you opt for a mantel surround that has tall pillars, as they will cause the eye to naturally move up the height of the surround. It’s important to consider the material and color of your surround, as this will play a huge role in how the fireplace looks and whether or not it takes command of the room or blends in. Unfortunately, mantel surrounds are generally much more expensive than a simple mantel shelf, due to the additional materials used and the time spent making them, but if you have the budget, then this is a great way to showcase your fireplace and ensure that your home is as impressive as possible. If you do not have a lot of room around your fireplace, then you may want to opt for a fireplace mantel shelf instead of a mantel with a full surround. While there are some fireplaces located in the room with plenty of space on both sides, if your fireplace is near to structures such as a window, door, or wall, then you will want to opt for a mantel shelf. Not only is this the better option if you are concerned about how much room you have around your fireplace, but it is ideal in smaller rooms, as a mantel shelf will give the illusion of your room having much more space. This will allow the eye to drift from side to side, rather than being visually stopped by the mantel surround. If you have a minimalist style, then you will love the way that a mantel shelf will fit right in with the rest of your home’s décor. These mantel shelves are also much less expensive than mantel surrounds are. If you are on a budget and want to finish your fireplace, but don’t have a lot of money to buy a full mantel surround, then a shelf may be the perfect thing for you. Modern fireplace mantels are going to be very clean, unadorned, and often come in simple colors. Rather than some other types of mantels that are heavily decorated or carved, when you opt for a modern fireplace mantel, you won’t have to worry about it competing with the items that you have out for display. A modern or contemporary mantel will be a great fixture in your room, but it won’t be as commanding for attention as other styles will tend to be. A fireplace mantle that looks like it belongs at the beach will still be just as functional as other styles of mantels but will have a few differences that will set it apart. If you want to buy a fireplace mantel for your beach home, then you need to consider the type of material that you are going to use. In general, beach style fireplace mantels are going to be made out of wood, and they will have a stain on them that will make them lighter. They may look gray from the stain, which will match the way the ocean looks during a storm, and they can even mimic the appearance and color of driftwood. While you can use this style mantel in any home, it will generally look out of place in a home that isn’t at the beach unless you have decorated the rest of your house in the beach style, as well. Traditional and modern fireplace mantels don’t look very different from each other. They will both have straight and simple lines that won’t detract from the beauty of the mantel itself. One way that traditional mantels will differ from modern ones is that they tend to be a little more ornate. It is fairly easy to find traditional mantels that have some carving or other designs in them, which will add to the visual interest of the mantel, although you do have to be careful and take time to dust them so that they don’t look dirty and unkempt. Depending on your home and your style, you may want a fireplace mantel that is a little bit more rustic. These mantels are going to be as attractive as other styles, and they will fit in very well in a farmhouse. Look for a fireplace mantel that is distressed, made of reclaimed wood, or has some rough edges if you want this look. Just like with other styles, you do need to make sure that you take care of your rustic fireplace mantel so that it will be protected from the heat of the fireplace and anything that you set on top of it. Even though it is rustic, you should still care for it. Homes that are decorated with an industrial style or theme can benefit greatly from having an industrial fireplace mantel install in the room. These are going to be a little more refined and less flamboyant than some other styles of fireplace mantels, but that doesn’t mean that they are any less attractive. If you are interested in this style of the fireplace mantel, then you will want to make sure that you consider one that is dark and made of metal or a dark wood. While lighter woods and materials may seem like they will contrast nicely in your home, to carry the style and theme throughout the room, make sure that you opt for something that feels and looks a little bit more industrial. Some of the most elaborate and intricate fireplace mantels that are available on the market are ones that are cut and designed in the Victorian style. These will look out of place in many homes, which is why you need to make sure that you really consider your personal style and the style of your rooms before you opt for these ornate mantels. Because they are so intricately carved, they are often more expensive than other styles of mantels, which may place them out of your budget. Make sure that your room is large enough to allow the mantel to be the star of the show and so that it doesn’t become overwhelmed in your space, which can happen in a small room or one that is too cluttered. Craftsman style fireplace mantels are typically going to be bold and visually heavier than other styles of fireplace mantels. When you opt for a craftsman fireplace mantel, you can have confidence that it will be solidly constructed and that it is very unlikely that it will break, chip, or fall apart. If you are interested in this style, then you need to make sure that you consider the way that the lines look on the fireplace, as craftsman style furniture is characterized by bold lines, a great attention to detail, and a piece that will last for a long time without problems. If you have other craftsman furniture in your home, then you will love the way that this fireplace mantel will tie together space and make it feel and look cohesive. This is a very common material for fireplaces mantels to be made out of, not only because it is so easy to find wood to use, but also because this material is relatively easy to work with. If you are worried about affordability, then you will want to opt for a wood mantel, as they are generally going to be much more affordable. Another benefit of a wood mantel is that you can find ones that are very simple and minimalistic or ones that are ornately carved, depending on the style you want for your home. Wood mantels are generally made from hardwoods, such as oak, cedar, and cherry. Finally, if you tire of the appearance of your wood mantel, then you can easily paint or stain it to change up how it looks and the way it matches with your style and décor. There is something very visually appealing about a metal fireplace mantel. Depending on the type of metal used, the style of the mantel, and what kind of finish is applied once the mantel is completed, metal fireplace mantels can be very historical in their appearance or look very modern and contemporary. These are uncommon and incredibly eye-catching, which means that they are sure to draw the attention of anyone coming to your home, as it is difficult to make sure that it fits harmoniously with the rest of your décor. If you tire of the appearance of your metal fireplace mantel you can easily paint it another color. While metal isn’t a very cozy looking material, depending on how you decorate your mantel, you can make it appear a little homier and either comfortable or industrial. If you love the way that a wood fireplace mantel looks, but you don’t have the budget for one carved from solid wood, then manufactured wood is a great option. One thing that many people don’t realize when they opt for fireplace mantels made from manufactured wood is that it is almost impossible to tell the difference between solid and manufactured wood. This means that you can enjoy the warm and cozy appearance of a wood fireplace mantel without the high price tag. This is a great option no matter whether you are going to be updating the home and flipping it for a profit or plan on living in it for a while but don’t want to make a huge investment into the fireplace. While not nearly as common as other types of materials, which makes it much harder to find fireplace mantels made from this material, glass is a gorgeous option for any home. Glass fireplace mantels are generally the shelf option, not the surround, and they are sure to attract attention. They blend seamlessly into the décor of any home, allowing the decorations that you put on your mantel to really shine. Additionally, because the class is clear, you can use strategically placed lights to highlight the mantel and the items that you have on display. Make sure that you choose tempered glass, which isn’t just easy to maintain and to clean, but is much less likely to break due to high heat or heavy displays. Unfortunately, glass fireplace mantels can break if they are knocked, and they will tend to shatter. If there is a small crack in the mantel, then it is very likely that the entire thing will break. Using tempered glass has another benefit – any pieces of broken glass will be very small, not large and sharp pieces. If you love the way that stone fireplaces look, but don’t have the budget necessary to have one carved out of solid stone for your home, then a cast stone fireplace mantel is a great option for you. These are made from stone chip aggregates that are then pressed into a flexible mold to form the fireplace mantel. While they are more expensive than other types of fireplace mantels available on the market, they are still a viable option for people who love these looks. The stone chips that are used are sometimes waste from other processes, which means that you can be sure that your mantel is more eco-friendly than some other options. Additionally, since these fireplace mantels are regularly mass-produced, the cost of each mantel will decrease. These mantels are easy to install since they are usually in just one piece and because they are significantly lighter than natural stone is, which is great if you are worried about your home supporting the weight of a heavy mantle. If you want to have a bespoke fireplace mantel made, then you can expect to pay much more than you would if you were to choose one that is mass-produced. While this is a much lighter option than natural stone, these fireplace mantels are still very heavy, and it is necessary to have help installing them. Finally, you do have to make sure that you seal your cast stone fireplace mantel. Otherwise, it will absorb dirt and soot, causing the surface to stain. This is a very elegant and sophisticated option for your fireplace mantel, and it is a very bold choice that will stand out in any home. Many people think of marble as being very extravagant, which means that it may look out of place in a smaller home and is better suited for use in a mansion or other estate home. If you want to change the look and feel of your marble, you can polish or hone it for a less or more formal feel. One thing that you need to remember is that your marble fireplace mantel needs to be sealed so that it will remain protected against any acidic products and moisture. This is one of the most expensive materials that you can use for your fireplace mantel, but the eye-catching result and the large selection of colors that you can choose from making it an obvious choice for some people. While not as bold or expensive as a marble fireplace mantel, one made out of limestone is much more subtle and will definitely warm up the appearance of your home. If you want a more understated look, then limestone may be just the material that you are looking for. This type of fireplace mantel can be left very simple for a modern look or can be carved to be much more ornate and intricate. For a very rustic look, some homeowners have used stacked limestone for a look that is hand-crafted. Because limestone is so soft and absorbent, you do need to make sure that you use a sealant on your new mantel. This will not only keep the limestone look nice and fresh, but also protect it and make it easy to wipe clean with a cleaner and warm water. Depending on the style and décor of your home, a distressed fireplace mantel may fit in perfectly with the rest of your space. This type of mantel is often designed to let the true beauty of the wood show through while still adding a little added visual interest to the mantel itself. Look for one that has been professionally distressed, as otherwise, they may look a little messy, which isn’t something that you want from your mantel. There’s something really special about a hand-carved mantel. Unlike ones that are mass-produced, when you buy a mantel that has been hand-carved, you will know that someone took a lot of care in producing the mantel, and it will be different from others on the market. It’s the little differences that occur when something is handcrafted or carved that can make it something very special and turn it into a family heirloom, rather than just a piece in your home. There aren’t very many fireplace mantels that have built-in storage, but if you want to make sure that you have plenty of space in your home for the items that you need, then this is something that you will want to consider looking for. Generally, it is going to be fireplace mantel shelves that will have this storage, and it will be an open storage shelf under the main mantel. While they won’t have enough room to store lots of items, you can still stash remotes, books, or knick-knacks in this space. Perfect for people who are concerned about the effect of buying a new mantel will have on the environment, a mantel that is made out of reclaimed wood is a great way to get the right mantel for your home without worrying about cutting down more trees. Reclaimed wood can also be very special, as the wood may be from an old family home, barn, or other structure. 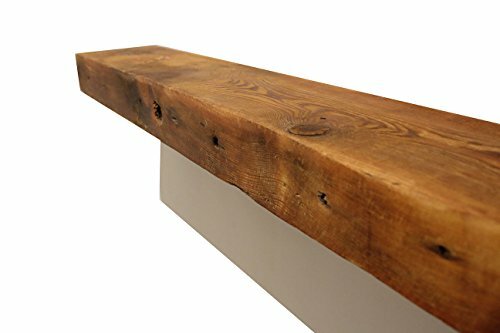 When you buy a mantel made from reclaimed wood, then there is a lot of joy that you will feel in having a piece of history in your home. If you want to have complete creative control over what your fireplace mantel is going to look like, then you will want to opt for one that is unfinished. While it can be a little more difficult to find ones that are unfinished, buying one will allow you to paint or stain it so that it will perfectly match the rest of your home. This is a great idea if you have furniture in your home that doesn’t all match or if you are worried that the options available in stores will not work with the rest of your space. Be prepared to do some work to make your mantel look great, but then you can be certain that it will improve your space, not compete with it.